An outbreak of measles has been confirmed in the Wirral area of Merseyside, with 22 cases reported. Public Heath England (PHE) said none of those who had caught the infectious disease had received the MMR vaccine, which protects against the illness. PHE has urged people in the area to check that they and their children had received both doses of the jab. It warned further cases were likely as unprotected teenagers and young adults attend festivals or go on holiday. Measles is a highly infectious viral illness that can sometimes lead to serious complications and can be fatal in rare cases. 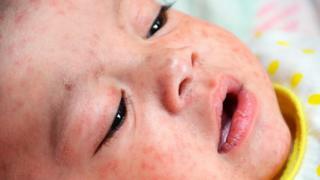 Symptoms include a high fever, red eyes, coughing, and aches followed by a blotchy red-brown rash. Between 1 January and 22 July this year, there have been 781 confirmed cases of measles in England, latest figures show. Adults and young people aged 15 and over who missed out on the MMR vaccine have been particularly affected. But anyone who has not received two doses of MMR vaccine is at risk, warned public health officials. Young people mixing closely at festivals are in the highest risk group as well as unvaccinated people travelling to Romania and Italy where there are large ongoing outbreaks. A free drop-in session for 11 to 19-year-olds will be held on Thursday at the Victoria Central Health Centre in Wallasey. A previous outbreak in Merseyside and Cheshire was confirmed in January.